The search for the perfect skincare product is the primary focus for husband and wife team David and Erica Chung. 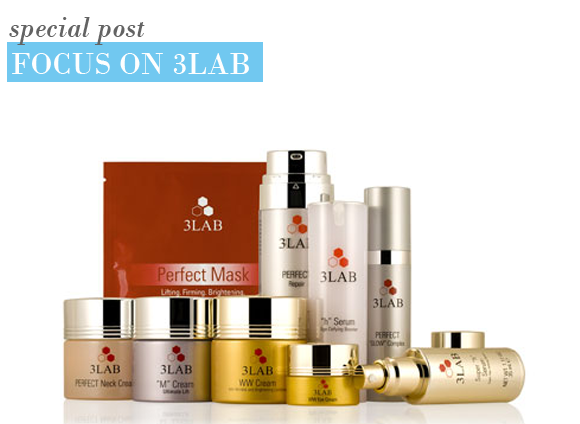 With a combined 40 years of experience in the beauty industry, they created 3LAB: the perfect anti-aging collection to suit even the most discerning of customers. The quest for ultimate results keeps Erica and her chemist team busy. Their domain is a cutting edge laboratory, their weapon of choice is technological advancement in the field of skincare, and the result is a line of highly effective and innovative products that utilise the most advanced ingredients possible. Seven long years of testing and refining by two leading chemists and one dermatologist have led to the line of 3LAB products today known and loved the world over. Esquire loves the ultra-luxe WW Cream (In the Bathroom Cabinet, January 2011), a deeply hydrating complex to brighten, treat wrinkles and give the skin a youthful plumpness. Utilising rare natural ingredients and antioxidants, the skin is rejuvenated and given a new lease of life. Harpers Bazaar picked the Perfect Neck Cream (Get the Glow from Neck to Toe, March 2010) as their top anti-ageing tip for the body, while Marie Claire (She Felt Bad about her Neck, January 2010) lauded it as an alternative to plastic surgery. With its potent anti-ager Abyssine 657, the synthetic growth hormone Nano-Claire GY™, and a firming complex of zinc, copper and magnesium, it’s little wonder they found it so effective. Vogue took a closer look at the chief ingredient of the M Cream: apple stem cells (The Super Apple, November 2009). As the first cosmetic to contain cells from the extremely rare Uttweiler Spatlauber apple, it is a truly innovative and unique moisturiser, aiming to improve radiance, resiliency and texture. There’s no shortage of fans in the celebrity world for the skincare range du jour either. Brand advocates include actresses Helen Mirren, Olivia Wilde and Jennifer Love Hewitt, whilst actors Samuel L. Jackson, Forest Whittaker and Jake Gyllenhaal round up the starry ensemble nicely. Free Gift Offer: Luxury travel sizes of the WW Cream and the Hydra Day Cream when you spend over £100 on 3LAB Skincare, worth £44. A good cream that certainly helps with the tone of the skin. However, I was expecting something more given its price. I have used other excellent creams in the past (such as Estee Lauder's Re-Nutriv)and got very similar results. Maybe after a certain age (60) there is only that much that one can achieve without surgery! This entry was posted on Tuesday, January 25th, 2011 at 9:03 am and is filed under Skincare, Spotlight On. You can follow any responses to this entry through the RSS 2.0 feed. You can skip to the end and leave a response. Pinging is currently not allowed.